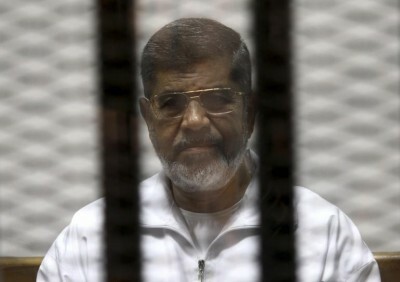 Following his overthrow in a July 2013 military coup, his unlawful detention, and a secret political trial, Egypt’s ousted president Mohamed Mursi was sentenced to 20 years in prison Tuesday on trumped-up charges of ordering the arrest and torture of protesters outside the presidential palace in December 2012. He and his co-defendants were acquitted on more serious charges of murder and possessing ammunition, which are punishable by death. Sentenced along with Mursi were 12 other defendants who received 20 years in prison, and two who received 10. Like Mursi, they were all connected to the Muslim Brotherhood (MB) and its political arm, the Freedom and Justice Party, which have been banned by the military junta headed by Gen. Abdel Fattah al-Sisi and branded as terrorist organizations. Many of Mursi’s supporters and human rights groups had anticipated the court imposing either the death penalty or life in prison. The sentencing came on the heels of death sentences handed down Monday by an Egyptian court against 22 Muslim Brotherhood members on charges of attacking a police station in the Kerdasa district near Cairo in 2013. Ten days earlier, another court sentenced Muslim Brotherhood leader Mohamed Badie to be executed on allegations of planning attacks against the state. The charges in the trial stemmed from a December 2012 incident in which opponents of the Muslim Brotherhood government marched on the Ittihadiya presidential palace in the eastern Cairo suburb of Heliopolis, where they were attacked by Mursi supporters. Security forces refused to take any action to halt the fighting, which included an exchange of rocks, Molotov cocktails and shotgun fire. While 11 people were killed in the clashes, eight of them were Muslim Brotherhood supporters. The trial, however, dealt only with the deaths of one reporter, Hosseini Abu Deif, and two anti-Mursi protesters. The selective and political character of this prosecution—no one is being charged for the killing of the Muslim Brotherhood supporters—is obvious. It is all the more glaring since draconian sentences are being imposed for the deaths of three people in which there is no evidence linking the deaths to the ousted president and his aides, while the former dictator Hosni Mubarak has been allowed to walk free after presiding over the killing of close to 900 protesters during the revolutionary uprising of January-February 2011. This bloodletting was surpassed by the al-Sisi regime itself, which killed at least 1,000 demonstrators opposing the anti-Mursi coup in Cairo’s Rabaa Square and many hundred more elsewhere. Like Mubarak, Egypt’s current dictator has faced no retribution for these killings. Amnesty charged that the illegality of the proceedings against Mursi began with his July 2013 ouster, following which he was imprisoned under “conditions that amounted to enforced disappearance.” He was denied his right to be charged within 24 hours of his arrest and to challenge the charges. He was questioned without a lawyer present and denied the right to consult with a defense team until after his trial—held in secret—had begun. All of these actions are fundamental violations of due process and the Egyptian constitution, Amnesty said. Mursi still faces further trials on fabricated charges of plotting terrorist acts in collaboration with Lebanon’s Hezbollah movement and the Palestinian Islamists of Hamas, and of espionage for supposedly leaking state secrets to Qatar. He is also charged with breaking out of prison during the 2011 uprising against Mubarak, as well as insulting the judiciary. Al Jazeera quoted the Egyptian journalist Yehia Ghanem as saying that the al-Sisi junta was using the prosecution of Mursi to send a message that it will tolerate no political opposition. “The whole thing was calculated politically from the start. It sends a message to Egyptians and the rest of the world that there’s no future for any civil rule,” Ghanem said. Above all, these sham trials and draconian punishments are meant to intimidate the population and thwart a renewal of the revolutionary upsurge of the Egyptian working class that brought down Mubarak four years ago. “All Egyptians are entitled to equal and fair treatment before the law,” she added. This is unmitigated hypocrisy. Before Mursi’s sentencing, a total of 1,212 Egyptians had been sentenced to death in mass trials just since the start of 2014, while tens of thousands languish in Egyptian jails. None of this has stopped the Obama administration from providing unconditional support to the Egyptian military regime, with Obama personally phoning al-Sisi at the end of last month to announce that the White House had lifted its partial “executive hold” on the provision of military aid following the 2013 coup. Obama assured the dictator that Washington’s $1.3 billion in annual military aid to the Egyptian junta would continue unabated. The Obama administration is fully complicit in the bloody wave of repression in Egypt. Behind its cynical “human rights” posturing, it supports the Egyptian military regime as both a bastion against revolution within Egypt and an instrument for counterrevolutionary interventions elsewhere in the region, from Libya to Yemen.